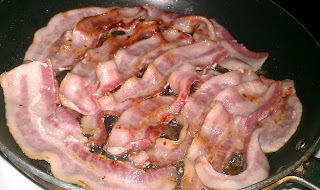 After cleaning and trimming up your ramps, fry enough thick cut bacon (I love the maple cured variety) for the number of servings you are making. 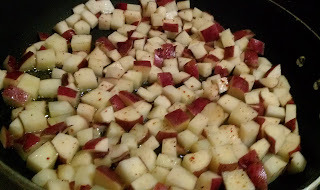 When the ramps are finished cooking, add the potatoes and fry until they are browned and crisp. 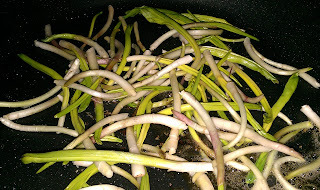 Since the potatoes takes a lot longer than the ramps or bacon, I will often start them first and add chopped ramps in with the bacon grease while they are frying to ensure that the bacon and ramps don’t get cold while the potatoes are frying. Once everything is done, I plate the bacon, ramps and potatoes and enjoy! If you want an even stronger ramp flavor you can add minced ramps to the potatoes while they are frying. My two boys love their potatoes this way and they taste great! The most important thing to remember when using ramps is that the flavor is much stronger than leeks or green onions so a small amount goes a long way. Additionally, similar to garlic your pours will sweat out the ramps the next day after eating them, so warn everyone around you that’s its ramp season. Or better yet make sure that they eat as many as you do!